Wage and income equity! The distant and much belated cousin to suffrage and equality – remains much desired but ever elusive in Aotearoa today. What I mean by this is that women, ethnic minorities, people with disabilities, and nondominant populations find themselves working for less pay, or in situations where their work is less-valued, or unworthy of substantive remuneration and empowerment, often due to deep-rooted ideas about the relative value of their gender, ethnicity, and social position. It’s pretty hard to figure out a clear picture on this in Aotearoa. 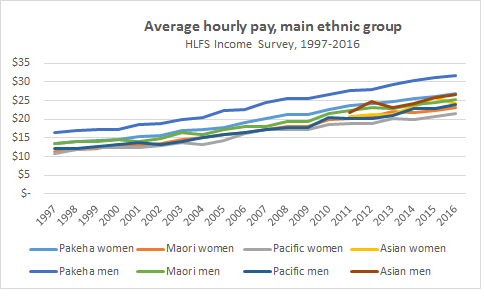 Below, I do my best to examine what wage equity is, where we stand in Aotearoa, and what the likely future looks like in light of some recent legal, political, and election-related hubbub on this topic. Income equity – what is it? Broadly put, this means equal pay for work of equal value – but this encompasses more than just the notion of ‘equal pay for identical work’. It also requires ‘work assessed as needing similar overall levels of skill, responsibility, effort, and work conditions to be paid equally’ . I’ve italicised what I think is important here, as there seems to be an aversion to acknowledging that our attitudes and dialogues around pay, labour, wealth, and income are as racialised as they are gendered. What’s the current situation in Aotearoa? Every so often, we hear about where we stand on wage and income equality in New Zealand, and how well or not-so-well we’re faring. Last year, we heard that the gender pay gap was the worst it has been in ten years. More recently, in our second leader’s debate, National leader Bill English mentioned that women’s wages were, in fact, rising at a faster rate than men’s, and we saw headlines celebrating the fact that the gender pay gap is its smallest since 2012. 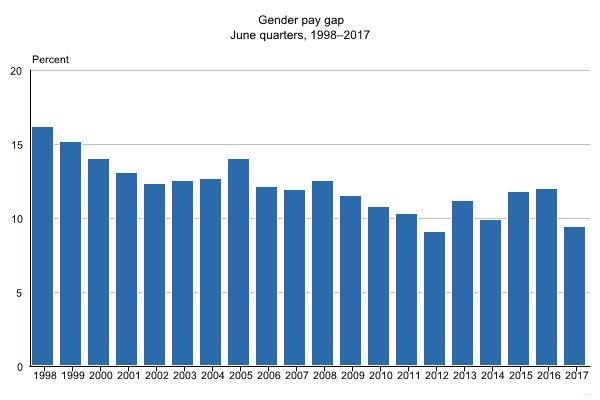 However, read further and we find that the gender pay gap is not at the level it was five years ago – it’s larger (9.4% in June 2017, compared to 9.1% in June 2012). If you’re confused, that’s natural – not everyone agrees on which set of numbers to use or how to interpret them. This is a topic that lends itself to conflicting and confusing headlines as well as sporadic attention in electoral politics, but it cannot easily be looked at in isolation. This makes it hard to draw any real conclusion about the health of wage parity across ethnicities, and genders, in our country. For example, the New Zealand Income Survey in 2015 showed that Māori earn $166 a week less than the average New Zealander’s weekly income. The continuation of this survey (the MSD’s Labour Market Statistics (Income)) survey shows that median weekly earnings for Europeans rose $38 (4.0 percent) to $997 – for European women, their earnings rose $32 (4.0 percent) to $832. Just last month, as Jess Berentson-Shaw wrote in the Spinoff, researchers at the Motu Institute found that “when we make other things the same, including the hours worked, the types of work, skills and expertise, we consistently find women are paid less than men”, and that Maori and Pacific women are paid even less. Further, discrimination against women based on employers’ beliefs about gender differences were clearly present. since the late 1980s, there has been a substantial increase in the proportion of households spending more than 30 percent of their income on housing. While income inequality has not (according to the Ministry of Social Development) increased in the past decade, New Zealanders are spending more of their income on housing. Nor has this gap been filled by social benefits – for example, while benefits for families with children were raised by $25 per week last year – average rents have risen even more. The Equal Pay Act 1972 and Government Services Equal Pay Act 1960 got rid of discriminatory female wages and sought to eliminate discrimination in wage negotiations. For reasons better elaborated by CEVEP and beyond the scope of this short article, the effectiveness of this existing legislation is questionable, particularly for addressing the systemic pay gap. Where do existing parties stand on this? While (some) parties do acknowledge the pay gap and have publicised their policies and plans (or existing efforts) to address it, it’s worth noting that almost none of the parties acknowledge the intersection between gender, ethnicity, disability or other factors that intersect to form these wide-ranging income inequalities. Over time, the gender gap is largely analysed or presented as one comparing men, and women, with the rare acknowledgement that the situation is worse for minority ethnicities. This misses that Maori and Pacific peoples, especially women, are over-represented in low-wage sectors – and often face additional, racist, barriers or attitudes than others when seeking employment or upward trajectory. A focus on employees as victims of unequal pay also fails to acknowledge that employers themselves must themselves become more flexible around non-work commitments and parental leave, for all men and women. Currently in the Select Committee stage before the Transport and Industrial Relations Committee, National’s Employment (Pay Equity and Equal Pay) Bill would repeal the Equal Pay Act and the Government Service Equal Pay Act, and amend the Employment Relations Act. This would introduce a system for determining those whose salaries it is fair to compare pay with – so that people attempting to make an equal pay claim must first look at others employed by their employer, and only if they can find no appropriate comparator, can they look to others within the same industry. The inability to compare with other industries is seen as a major problem. It also contradicts our Court of Appeal's decision in Terranova v Bartlett where the court was clear that comparators did not need to be confined to the employer and sector of the employees bringing the claim. It would also remove the ability to ask for back pay, and apply this retrospectively to existing claims. As an aside, if you feel like this is important to you – whether you agree or not with this bill’s methods or rules – make a submission! Select Committee submissions close 1 November. Jacinda Ardern has confirmed that Labour would scrap this bill and ‘start again’ if Labour is elected to government and, in particular, that Labour would alter the bill’s restrictions to bringing a claim. Earlier this year, Green MP Jan Logie’s members’ bill, which would have required businesses to report their gender pay gap to MBIE, was voted down (60 votes for, 59 against). This sought to ‘to increase the amount of information publicly available so that cases where this discrimination persists can be clearly identified, with the object to improve the likelihood of successful cases to be taken under the Equal Pay Act 1972 to seek remedies when such discrimination exists.’ It would have compelled employers to disclose the aggregated data showing the pay and gender for all employees doing the same kind of work, and would have drastically increased the penalties for a breach of the Equal Pay Act 1972 (from $400 to $5,000 for an individual or from $1,000 to $10,000 for a company or other corporation). This was opposed by National, Act and United Future on the grounds that it would be too great a burden on businesses and compromise privacy. It seems likely that whatever the outcome of the election, equal pay legislation is on the horizon. What matters is what values underpin it – how claims should be made, what assumptions we should make (e.g. equivalent Australian legislation does not rely on discrimination as the foundation of inequity, but has adopted the framework and assumption of ‘undervaluation’) , and how relative burdens should be shared. As CEVEP notes, it will take much more than pay equity to remedy the inequalities in the labour market and its permeations into the education, justice, and other sectors. However, if our currently triumphant narrative of continual economic growth and success is to be a believable one, it must show for all those working in Aotearoa. Everyone deserves a piece of the pie – and currently – some deserve a second helping before others. Maanya Tandon completed her LLB/BA at the University of Auckland, and her LLM at NYU, and has recently returned to Aotearoa after studying and working abroad. She is excited by the prospect of one day earning as much as her male counterparts will. Prue Hyman, “Is Active Intervention Still Needed to Improve the Position of Women in the New Zealand Labour Market? If so, what can be done?” in Policy Quarterly, Volume 11, Issue 1, February 2015, p 7.